On July 21, 1971 the Chicago Bears parted company with a player who had spent nine years with them, trading RB Ronnie Bull to the Philadelphia Eagles for an undisclosed draft choice that turned out to be a #5 pick in 1973 (it was used for DB Allan Ellis from UCLA). Bull demonstrated all-purpose skills at Baylor and was the seventh overall pick in the first round of the 1962 NFL draft (third overall by the Dallas Texans of the AFL). He started his rookie season as a reserve defensive back until HB Willie Galimore suffered a knee injury. Bull rushed for 363 yards, caught 31 passes for another 331 yards, returned nine kickoffs for a 26.1-yard average, and received NFL Rookie of the Year honors from UPI and The Sporting News. Bull split time with Galimore at halfback again in 1963, particularly early in the season when injuries were again a factor, and rushed for 404 yards on 117 carries as the Bears won the NFL Championship. Galimore was tragically killed in an auto accident during training camp in ’64 and veteran HB Jon Arnett was obtained from the Rams, again cutting into the playing time of Bull, who was hindered by a preseason injury. Bull lacked ideal speed for the halfback position and, while a good blocker, was small at 6’0” and 200 pounds to play fullback. The arrival of sensational rookie HB Gale Sayers in 1965 relegated Bull to fullback, and he ran for 417 yards while averaging a career-high 4.6 yards per carry. The next two years were not so productive but, in 1968, Bull achieved a career high with 472 rushing yards on 107 attempts (4.4 avg.). Sayers suffered a season-ending knee injury in the ninth game and Bull and HB Brian Piccolo picked up the slack, to good effect. But Bull suffered a knee injury in 1969 that limited him to six games and required surgery. He rushed for just 214 yards on 68 carries in ’70 at age 30, and with running backs drafted in the first two rounds for 1971, the stage was set for his departure from Chicago. As for the Eagles, coming off of four straight losing records, they had gotten fair production out of HB Cyril Pinder in 1970 and, while rookie FB Lee Bouggess averaged only 2.5 yards per carry, he caught 50 passes for 401 yards. But star FB Tom Woodeshick had gone down with a season-ending knee injury in the sixth week and there was little in the way of depth, and as a group the backs drew the ire of Head Coach Jerry Williams for not running well when getting into the open field – although they were not helped by the deficiencies of the offensive line. But Pinder, who had indicated his intention to play out his option and was out of favor with Philadelphia’s front office, was traded to the Bears for two draft picks just prior to the regular season. 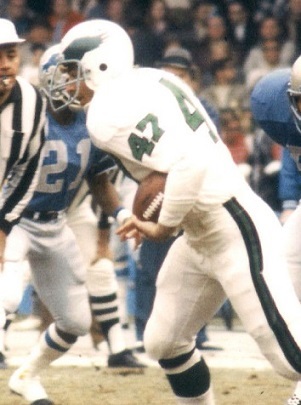 The Eagles started the season with Bouggess and Woodeshick, but Bouggess proved to be no more adept as a runner from scrimmage than he had been as a rookie and missed six games due to injury while Woodeshick was only a shell of the Pro Bowl-caliber ball carrier that he had once been. The team as a whole got off to a woeful start and Coach Williams was fired after the third week and replaced by Ed Khayat. Bull carried the ball just 11 times in the first five games before gaining 72 yards on 17 attempts against the Giants in a 23-7 Week 6 win, the club’s first of the year. He scored his only touchdown of the year two weeks later on a 12-yard pass reception at Washington, a game that ended in a 7-7 tie. Bull was most active in the last five games of the season, running 14 times for a season-high 73 yards in the rematch against the Redskins and totaling 52 carries for 223 yards (4.3 avg.) in all during those contests. The team won four of those games on the way to a 6-7-1 record. Bull finished with 351 rushing yards, a modest enough total but enough to lead the club. It was a fitting end to a long, workmanlike career. Bull retired following the season, finishing with ten NFL seasons that resulted in 3222 yards on 881 carries (3.7 avg. ), 172 catches for 1479 yards (8.6 avg. ), seven completions out of 20 option pass attempts for 158 yards and a TD, and 18 kickoff returns for a 21.3-yard average. He scored a total of 14 touchdowns.